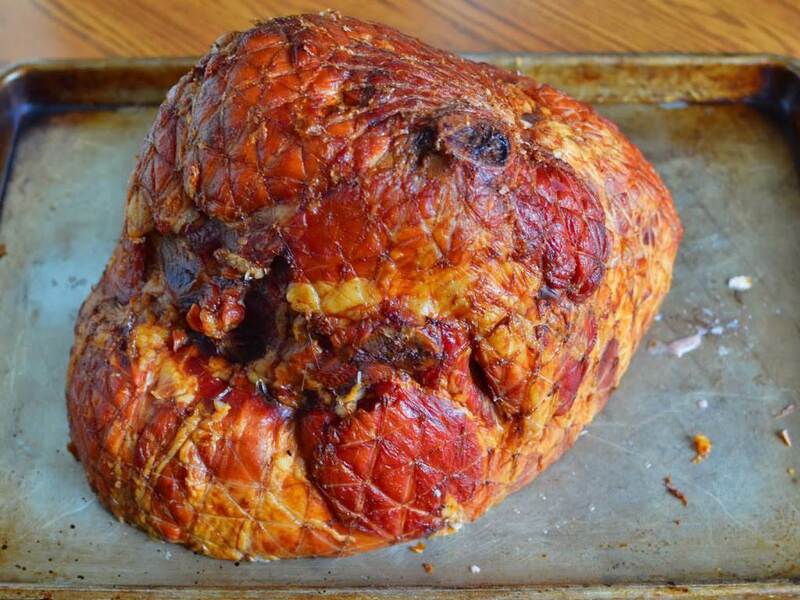 But this ham is a showstopper, with a crisped crust, melted pork fat, and sweet maple-brown sugar glaze. Yes, you’ll have to do your own slicing. Make sure all the pieces have a bit of the crust and your guests won’t miss perfect spiral slices. 1. Score and spit the ham: One hour before cooking, remove the ham from its wrapper and pat dry with paper towels. Cut the rind of the ham in a 1-inch diamond pattern, cutting about 1/4 inch deep. Skewer the ham on the rotisserie spit, securing it with the spit forks. Let the ham rest at room temperature until it is time to grill. 2. Make the glaze: Whisk the glaze ingredients in a small bowl until the brown sugar dissolves. 4. Set up the grill for indirect medium-low heat: Set the grill up for indirect medium-low heat with the drip pan in the middle of the grill. 5. 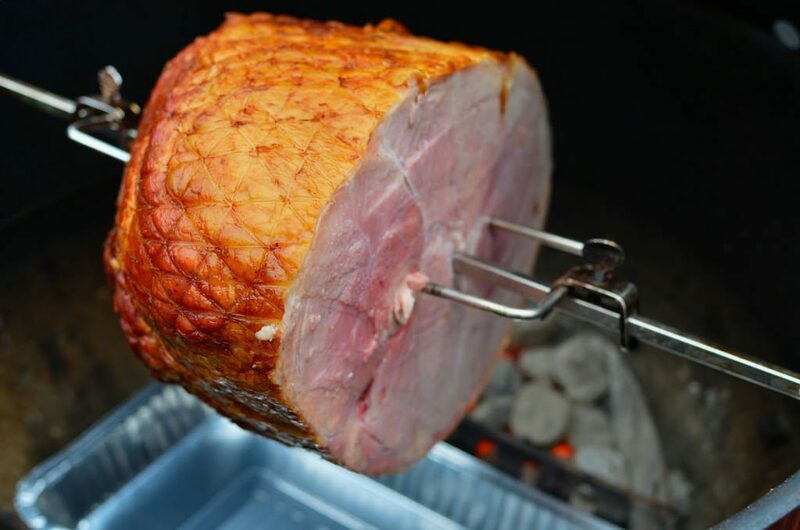 Cook the ham: Put the spit on the grill, start the motor spinning, and make sure the drip pan is centered beneath the ham. Close the lid and cook the ham until it reaches 140°F in its thickest part, about 3 hours. During the last half hour of cooking, brush the roast with glaze every ten minutes. 6. Serve: Remove the ham from the rotisserie spit. Be careful - the spit and forks are blazing hot. Let the ham rest for 15 minutes, then slice and serve. Do not use a spiral sliced ham for this recipe. The juices will leak out of the pre-sliced ham, and it will dry out on the grill. Get a ham labeled “ham”, “ham in natural juices”, or “ham, water added”. Avoid boneless “ham and water product”, formed into a loaf shape, which is a pressed loaf that is so full of water it will never get a good crust.